With hand sculpted mushrooms and little ladybird friends invites the Fairies to come and play. 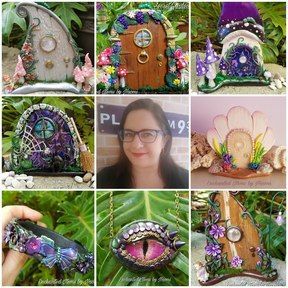 Additions like the bead lantern, a dangling key from the swirl top and a baby fairy holding a tiny ladybird... makes this door a very magical one. The Mushrooms, Moss, Leaves amd vines all hand sculpted and placed to make it look like the door hasn't been opened in a magical forest for a long time. This Door is free standing with it's own base. Approx. Size is 15cm heigh x 13cm wide base. Weather protected for out door use but recommend to use in undercover areas. Not suitable for children under the age of 3years old and adult supervision required.